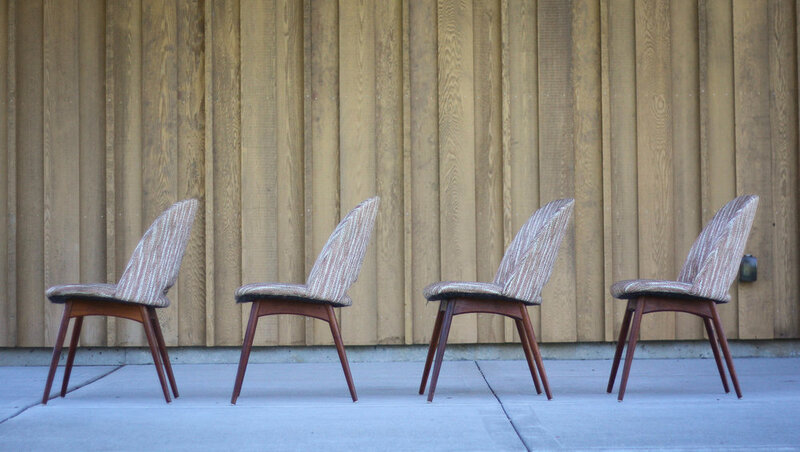 The 1404-C chair, also known as the Scoop Chair, was designed by Adrian Pearsall for his company Craft Associates. They feature solid American walnut legs with a scoop shaped seat similar to a Knoll Saarinen chair. The original, embossed, tweed like, vinyl upholstery is in tact with no holes or rips, but there are some areas of slight discoloration that could likely be cleaned up if desired. Reupholstering would be a breeze if you had a different fabric in mind. Frames have light scratches and dings, nothing that couldn't be sanded out and oiled if desired. We can also fully refinish the chairs for you for an additional fee. Priced for the set of 4.